Introduction Systematic reviews collate trial data to provide evidence to support clinical decision-making. For effective synthesis, there must be consistency in outcome reporting. There is no agreed set of outcomes for reporting the effect of burn care interventions. Issues with outcome reporting have been identified, although not systematically investigated. This study gathers empirical evidence on any variation in outcome reporting and assesses the need for a core outcome set for burn care research. Methods Electronic searches of four search engines were undertaken from January 2012 to December 2016 for randomised controlled trials (RCTs), using medical subject headings and free text terms including ‘burn’, ‘scald’ ‘thermal injury’ and ‘RCT’. Two authors independently screened papers, extracted outcomes verbatim and recorded the timing of outcome measurement. Duplicate outcomes (exact wording ± different spelling), similar outcomes (albumin in blood, serum albumin) and identical outcomes measured at different times were removed. Variation in outcome reporting was determined by assessing the number of unique outcomes reported across all included trials. Outcomes were classified into domains. Bias was reduced using five researchers and a patient working independently and together. Results 147 trials were included, of which 127 (86.4%) were RCTs, 13 (8.8%) pilot studies and 7 (4.8%) RCT protocols. 1494 verbatim clinical outcomes were reported; 955 were unique. 76.8% of outcomes were measured within 6 months of injury. Commonly reported outcomes were defined differently. Numbers of unique outcomes per trial varied from one to 37 (median 9; IQR 5,13). No single outcome was reported across all studies demonstrating inconsistency of reporting. Outcomes were classified into 54 domains. Numbers of outcomes per domain ranged from 1 to 166 (median 11; IQR 3,24). Conclusions This review has demonstrated heterogeneity in outcome reporting in burn care research which will hinder amalgamation of study data. We recommend the development of a Core Outcome Set. This review is a comprehensive and systematic search for all clinical outcomes reported in randomised controlled trials of burn care between and including 2012 and 2016. There is a detailed analysis of all reported outcomes and timing of outcome assessment. A multidisciplinary team including a patient were involved in the study. Quality assessment of studies was not undertaken as the purpose of the review was to extract clinical outcomes alone and not to assess the effect of an intervention. To date, there has been no formal investigation into outcome reporting in trials of burn care. The purpose of this study is to examine clinical outcome reporting in burn care research, to consider the types, definitions and timing of outcomes measured and to consider the need for a Core Outcome Set (COS) in this field. Types of studies: We included full text RCTs along with RCT protocols and pilot studies. The study design was limited to RCTs, as any final COS will be used for RCT reporting.29 We excluded protocols and pilot studies if the full RCT had been published within the selected time period. We also excluded conference proceedings and abstracts, non-English language publications and studies not involving human subjects. Types of participants: We included studies recording outcomes from patients of any age with a cutaneous burn of any type or size, determined by either clinician evaluation or objective assessment, or both, which required treatment in any healthcare facility. Studies where the population consisted of patients with combined thermal and mechanical injuries were only included if it was possible to separate out the burn care outcomes. Trials studying patients with pure carbon monoxide poisoning, chemical ocular or caustic oesophageal burns were excluded, as the former does not involve a burn and the latter have different aetiology and management to cutaneous burns. Type of interventions: Any surgical or non-surgical burn care intervention with any appropriate comparator. Types of outcomes: Defined as the exact terms used in a published trial abstract, methods or results including tables and figures for any observer-reported clinical endpoint. These included physiological, metabolic or adverse or mortality events measured by researchers and relevant to patients’ recovery and long-term well-being after burn care.30 Trials assessing quality of life were only included if the data were observer-reported. Prior to both abstract and full-text screening, all review authors underwent training to ensure a comparable understanding of the purpose of the review and the eligibility criteria. The reference management software EndNote V.6 (Clarivate Analytics, Boston; available at http://endnote.com/) was used to compile all titles derived from the initial searches, with duplicates removed for the review authors to screen titles and abstracts against the eligibility criteria. Screening of titles and abstracts was completed independently, then in duplicate by two authors (AY, AD) with experience in systematic review methodology. All screening disagreements were discussed, with any outstanding disagreements resolved by an independent reviewer (JB). Any studies appearing to meet the inclusion criteria based on the abstract were retrieved as full-text articles. Two reviewers then read the full-text articles in their entirety to assess for eligibility, with decisions on inclusion and exclusion recorded (figure 1 for flow diagram). Reasons for exclusion were ordered hierarchically (box 1) and applied to each full text. The highest reason for exclusion met by a paper was recorded as its reason for exclusion. Any disagreements were discussed with another author (JB). Preferred Reporting Items for Systematic Reviews and Meta-Analyses flow diagram. PRO, patient reported outcome; RCT, randomised controlled trial. Not published between 1 January 2012 and 31 December 2016. Not relating to burns or burn care alone. Population is non-human subjects (eg, animal studies, modelling). Abstract with no full text given. Study is not a randomised controlled trial testing an intervention on burn care. Laboratory based, not carried out in clinical setting, for example, exudate or blood samples from humans tested within laboratory. Systematic review paper, commentary paper. The aim of this study was to comprehensively document any variation in clinical outcomes selected, defined, measured and reported in burn care RCTs and not to synthesise data about the effect of interventions. Inclusion of all trials was necessary to demonstrate if a variation in outcome reporting was present across trials, regardless of quality of methodology of the trial. We therefore decided not to undertake a quality assessment of studies because it was not relevant to the data being recorded in this review; simply the nature and description of the unique outcomes reported in each study. Data were extracted into a standardised data extraction sheet (Microsoft Excel). This included study author, country or countries recruiting (categorised into the United Nations six regions31), publication year, number of sites and number of participants recruited per trial, design (full RCT, pilot, protocol) and intervention tested. For protocols, the planned participant inclusion criteria and sample size were extracted. No distinction was made between primary or secondary outcomes, although this was noted and is part of a separate project. All outcomes were extracted verbatim, with 20% of the extracted data verified by a second reviewer. True duplicates, spelled and worded the same, were deleted. As a second process, two reviewers (a clinician and researcher) discussed all verbatim outcomes to assess duplicates in meaning but spelled or worded in a slightly different manner; such as length of time in hospital and number of days in hospital, platelet level and levels, and serum interleukin (IL) 10 and IL-10 in blood. These were named as one outcome with wording chosen by the reviewers and the others deleted as duplicates. The remaining outcomes were therefore all different in meaning. Any discrepancies were discussed with a senior researcher (JB). The number of outcomes per trial and the variation of outcomes between trials was recorded. The time after injury that outcomes were measured were noted separately in order to (a) assess the heterogeneity in outcome measurement timing and (b) to understand at what stage after injury the effects of the intervention were being assessed. If a single outcome was assessed at different timepoints, all assessment timings were recorded. Data extraction for the timing of outcome reporting from 10% of trials was undertaken independently by another researcher. Timings of outcome assessment were categorised into time periods; <1 month, >1 month and <3 months, >3 months and <6 months after injury, >6 months and <1 year and >1 year and <3 years, and >3 years. We reported two other outcome time periods; those assessed during acute hospitalisation and during burn wound healing, as these were commonly reported in the literature with no proscribed timepoint. However, it was clear from the reported length of stay and healing data, that all these outcomes were assessed within 6 months of injury. The frequency of outcomes reported within each time period was recorded. The data were tabulated so that each study was listed with study and population details along with outcomes measured. Outcomes were extracted from this spreadsheet into another, with duplicates removed as described above. Outcomes measuring the same healthcare issue but at different timepoints were noted as one outcome for the final set. These final unique outcomes were then grouped into domains. Outcome domains are groups of similar outcomes. This organisation is necessary, as maintaining a large set of outcomes when a significant number are similar, would make any future classification of the outcomes in terms of importance, extremely challenging. The results described below indicate the characteristics of the reported studies and provide detail on heterogeneity of outcome reporting between studies, outcome definitions, timepoints and outcome domains. The need for a burn care COS project was conceived following discussions regarding clinical healthcare Key Performance Indicators with professionals and patients. The patients were vocal about outcomes important to them which they felt were overlooked by professionals, such as pain. The systematic review was discussed at regular project steering group meetings attended by three patients with burns and one parent of a child with burns. A patient with burns is a coauthor and was involved with writing and editing of this article as well as with the naming of the outcome domains. Dissemination will be to the lay representatives of the steering group and will inform the Core Outcome Set study in which patients are actively involved. Of the 147 studies (table 1), 86.4% (127) were reports of full RCTs, 8.8% (13) were pilot studies and 4.8% (7) were study protocols. The number of studies published increased between 2012 and 2016, with 26 RCTs published in 2012 and 40 in 2016 (table 2). A total of 9022 participants were recruited across the 140 studies (study protocols not included n=7). The number of patients recruited per trial ranged from 3 to 612 (median 50; IQR 30–88) for full RCTs and from 10 to 52 (median 21; IQR 16–28) for pilot studies. 50.4% of full RCTs recruited fewer than 50 participants (table 2). The majority (89.7%) of studies recruited (or planned to recruit) participants on one site alone. Of the 10.2% (15) of studies that were multicentre, nine (60%) undertook research at only two or three sites. Thirty-two countries from the six global regions recruited patients into the 147 RCTs (table 2). The country that undertook the most studies was the USA with 22.4% (33), followed by Iran with 12.9% (19) and China with 10.9% (16) of published studies. Of the 32 countries, 59.3% (19) published only one trial in this time period. The most common trial interventions related to dressings and wound care 29.2% (43), followed by surgical technique 11.6% (17) and management of pain and itch 10.9% (16) (table 2). A total of 1494 clinical outcomes were reported of which, after de-duplication, 955 different, unique outcomes remained. Of the 1494 outcomes reported, 27.7% (421) were common across two studies or more. Of these outcomes, 50.3% (78) appear in only two trials and 84.5% appear in five trials or fewer. The number of outcomes reported per trial varied from one to 37 (median 9; IQR 5,13) (table 3). No single outcome was reported across all 147 studies. Outcome definition variation: Outcomes assessing the same healthcare issue were commonly defined differently. An example is burn wound healing which was defined in 166 different ways. Examples include: healing percentage at specified timepoints, incidence of complete wound healing, incidence of 30% wound healing and length of time until 50% epithelialisation of burn wound. Similar variation in definition of burn wound infection existed with 79 unique outcome definitions including: bacterial colonisation of burn wound, days of antibiotics, incidence of local infection, incidence of positive wound cultures, periwound redness, rate of bacterial clearance from wound and number of inflammatory cells in the wound. 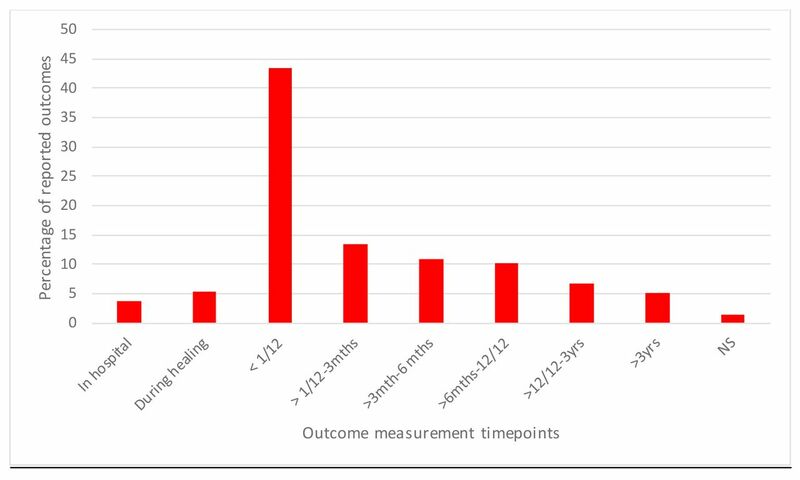 Outcome timing variation: There were 2743 outcomes measured if the same outcome measured at different timepoints across all the 147 RCTs are included; for example, size of burn wound measured at 1 week and again at 2 weeks, were recorded as different outcomes for this exercise. Of these, 76.9% (2109) were assessed at less than 6 months after injury, 16.6% (456) were measured after 6 months and before 3 years after injury, and only 5.1% (140) were measured at more than 3 years after injury (figure 2). The timing of outcome measurement was not reported for 38 outcomes. Reported timepoint at which outcome was assessed. mths, months; NS, not stated; yrs, years. Outcome domains: The 955 different clinical outcomes were organised into 54 domains (groups of similar outcomes). Table 4 categorises the domains into over-arching categories and gives examples and total numbers of outcomes within each domain. 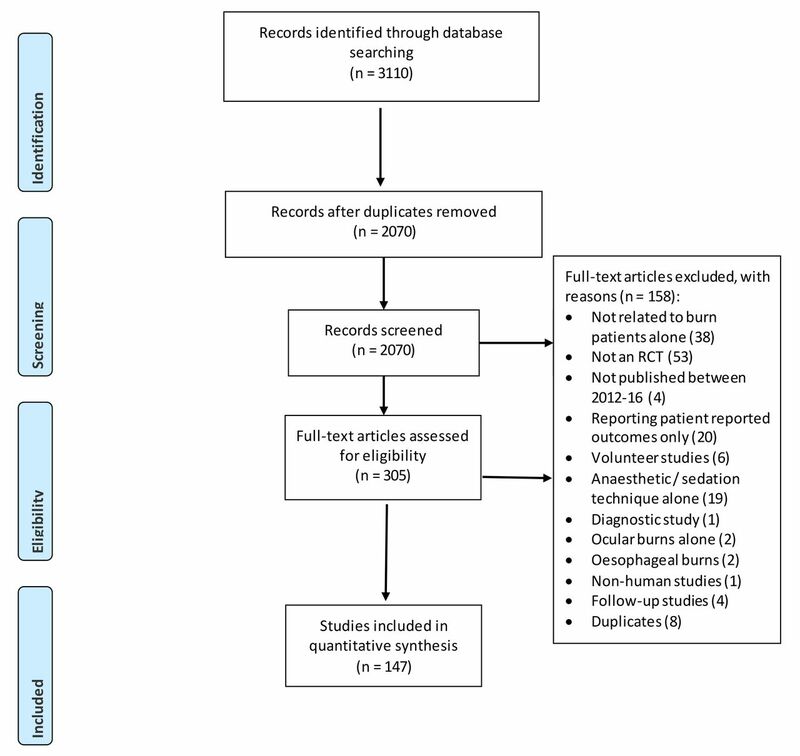 This systematic review aimed to examine outcome reporting in RCTs in burn care. Of the 147 included studies, 1494 outcomes were identified with 955 of these unique. There was overlap in terminology, inconsistent definitions and variation in time after injury at which the outcomes were measured. Only 30% of the outcomes reported were included in more than one study. There was no single outcome reported across all 147 trials. Commonly-reported outcomes were defined differently between trials, such as burn wound healing which was defined in 166 different ways. Such heterogeneity of outcome reporting across trials will limit evidence synthesis and result in research wastage. In this review, we identified and agreed the grouping of the 955 unique outcomes into 54 outcome domains. There is no agreement between COS reviewers about how best to classify outcomes into domains. Williamson published a taxonomy of categorising outcome domains.198 Other authors have suggested different ways of doing this, all addressing different needs32 33 199). In the Williamson taxonomy, the authors state that of 99 COS studies, 21 applied their own approach to outcome classification and only six used an existing system. As we had identified a large number of different clinical burn outcomes and as the outcomes we extracted did not clearly fall within the Williamson taxonomy, we decided to use our own approach to domain classification. We used five multidisciplinary researchers and a patient working independently, and subsequently together, to bring different views and as little bias as possible to the process. The strengths of this review are that the protocol and data extraction proforma were prespecified and the literature search was systematic and comprehensive, including four major healthcare trial databases. To account for multidisciplinary perspectives, two researchers, two clinicians and a patient were involved in the domain process. It is also novel because it is the first to demonstrate, in detail and using systematic methodology, the scale of the heterogeneity of outcome reporting in burn care research. Limitations include the exclusion of publications in languages other than English. However, international publications were included to reduce the risk of selection bias. The search was also time-limited which may have excluded outcomes from older studies. The reason for the time limitation was to identify research relevant to modern burn care. The search was also limited to trials reporting clinical outcomes. Other work is in progress to assess patient-reported outcomes in burn care research. This was a review undertaken systematically to a prespecified protocol. However, a formal quality assessment of studies was not undertaken, as we were researching the reporting of outcomes and not attempting to analyse the effects of interventions. A COS for burn care research would address the issue of heterogeneity of outcome reporting between trials, lead to research that is more likely to measure relevant outcomes, enhance the value of burn care systematic reviews and reduce research waste. We have shown that multiple different unique outcomes are reported in trials of burn care interventions. Different definitions are used to assess the same outcome issue and outcomes are measured at different time points after injury. This heterogeneity and inconsistency in outcome reporting prevent effective evidence synthesis and limits the quality of evidence available for clinical decision-making. Our review demonstrates that until greater consistency is achieved in outcome reporting in trials, it is unlikely that clinicians will be able to synthesise evidence across studies to understand the effects of surgical and non-surgical treatments following burn injury. It is recommended that a burn care COS is developed to support the effective synthesis of trial data and allow more informed clinical decision-making for the benefit of patients. We would like to thank Dr Jason Wasiak, Senior Research Fellow, University of Melbourne, Monash University, Medical School, for his invaluable help in critically editing the paper. We would like to also thank Ms Joanna Hooper, senior outreach librarian and the University Hospitals Bristol NHS Foundation Trust medical library for their help in accessing articles.
. A WHO plan for burn prevention and care. Geneva: World Health Organization, 2008.
. Evidence-based healthcare: how to make health policy and management decisions. London: Churchill Livingstone., 1997:53.
. Characterization of early thermal burns and the effects of hyperbaric oxygen treatment: a pilot study. Diving Hyperb Med 2013;43:157–61.
. The effect of healing touch on sleep patterns of pediatric burn patients: a prospective pilot study. J Sleep Disor 2014;6:2.
. The effects of intravenous glutamine supplementation in severely burned multiple traumatized patients. Farmacia 2013;61:212–9.
. Efficacy of platelet rich plasma application in comparison to conventional dressing therapy in partial thickness burn wound. Medical Forum Monthly 2014;25:27–30.
. Effect of probiotic administration in the therapy of pediatric thermal burn. Ann Burns Fire Disasters 2016;29:268.
. The effect of levamisole on mortality rate among patients with severe burn injuries. J Res Med Sci 2013;18:795.
. Quality of pediatric second-degree burn wound scars following the application of basic fibroblast growth factor: results of a randomized, controlled pilot study. Ostomy Wound Manage 2012;58:32.
. The effect of Distraction Technique on the pain of Dressing change among 3-6 year-old children. Int J Pediatr 2016;4:1603–10.
. Effects of enteral glutamine supplementation on reduction of infection in adult patients with severe burns. East Afr Med J 2014;91:33–6.
. Enhancement of burn wounds healing by platelet dressing. Int J Burns Trauma 2013;3:96.
. Effect of immune-enhancing diets on the outcomes of patients after major burns. Ann Burns Fire Disasters 2014;27:192.
. Evaluation of who oral rehydration solution (ORS) and salt tablets in resuscitating adult patients with burns covering more than 15% of total body surface area (TBSA). Ann Burns Fire Disasters 2016;29:43.
. Effect of low-intensity laser on the neuropathic common peroneal nerve post burn.
. Evaluation of the “Early” use of albumin in children with extensive burns: a randomized controlled trial. Pediatr Crit Care Med 2016;17:e280–e6.
. Effectiveness of cerium nitrate–silver sulfadiazine in the treatment of facial burns: a multicenter, randomized, controlled trial. Plastic and reconstructive surgery 2012;130:274e–83.
. Prospective comparison of packed red blood cell–to–fresh frozen plasma transfusion ratio of 4: 1 versus 1: 1 during acute massive burn excision. Journal of Trauma and Acute Care Surgery 2013;74:76–83.
. A herbal cream consisting of Aloe vera, Lavandula stoechas, and Pelargonium roseum as an alternative for silver sulfadiazine in burn management. Asian Biomedicine 2012;6:273–8.
. Effectiveness of Aloe vera gel compared with 1% silver sulphadiazine cream as burn wound dressing in second degree burns. J Pak Med Assoc 2013;63:225–30.
. A comparative study of spray keratinocytes and autologous meshed split-thickness skin graft in the treatment of acute burn injuries. Wounds 2015;27:31–40.
. Dressings for superficial and partial thickness burns. Cochrane Database Syst Rev 2008;4.
. Amniotic membrane transplantation for acute ocular burns. Cochrane Database Syst Rev 2011;9.
. Outcome measures for adult critical care: a systematic review. Health technology assessment 2000;4:1–111.
. Outcome measures for low back pain research. a proposal for standardized use. Spine 1998;23:2003–13. Contributors AEY wrote the paper and conceived the project with the support of JMB. JMB and SBr edited and critically revised the article. AD contributed to data extraction and edited the paper. SBl assisted in the domain name choice and article editing and readability. All authors have read and approved the manuscript. Funding This article/paper/report presents independent research funded by the National Institute for Health Research (NIHR) Doctoral Research Fellowship DRF-2016-09-031. JMB is part-funded by the Medical Research Council ConDuCT-II Hub (Collaboration and innovation for Difficult and Complex randomised controlled Trials In Invasive procedures—MR/K025643/1). The study was also supported by the NIHR Biomedical Research Centre at the University Hospitals Bristol NHS Foundation Trust and the University of Bristol. Competing interests JB is an NIHR Senior Investigator. All other authors declare no competing interests. Ethics approval South West Frenchay Research Ethics Committee (ref: 17/SW/0025 IRAS 221625).